Q1. Australian Football looks rough. Is Auskick safe for children to play? Answer: Some people believe football is rough because they only watch AFL football. That’s like saying you won’t buy your child a toy pedal car because so many people are injured in road accidents. AFL footy is professional, Auskick is recreational. Independent research shows that Auskick is virtually injury free. Q2. My child is not very good. Is there any point in joining? Answer: Children of all ability levels are provided with opportunities to learn and have fun. Early participation in sport and physical activity develops motor skills very important as a foundation for lifetime participation in sport and recreation. If the foundation is not there, children usually avoid sport altogether and so miss its lifetime health benefits. It is especially imperative then that children who “are not very good” participate. Q3. What about 5 year olds, is it suitable? Answer: Refer to the previous answer. Children commence their motor skill and coordination development from the day they are born. They do this mainly through the avenue of physical “play games”. These are sorts of constant practice sessions for them. Their learning rate at this stage is faster than at any other stage of life. Early Auskick concentrates on providing opportunities for further practical practice with developmental age graded “play games’ and “play activities’. This lays a solid foundation for future participation and physical health and wellbeing. In fact, they are often called foundation skills. Q4. Is it suitable for girls? Answer: Things have changed in recent years and now many girls participate in Auskick. A motor skill development program like Auskick is perhaps more important for girls than boys. Research indicates that girls stay away from playing sport more than boys and by the secondary school level, often lack the required foundation skills to join in any sport or physical activity. For girls who like competitive football, there are competitions available through all age levels after about age 10, and recreational footy for the others. Q5. I was never much good at sport myself. Can I participate? Answer: It is very important that all parents participate no matter how busy they are and regardless as to whether they are good at sport or not. Auskick is regarded by many parents as an important priority family time with their children. They just mark it into their diaries. Research indicates that children are more successful at learning, enjoy activities much more and are more likely to persist when their parents are involved. Many parents join the activities with their kids and learn with them. It’s good to have things in common in a family. Q6. What do parents do? Answer: Auskick is completely conducted by parents. Activities include coaching, supervising and administrating to mothers’ club type activities. Full education and resource support is provided. Our research indicates that our parents consider Auskick to be special and that it belongs to them as much as it does to their kids. They consider it to be a type of community where help is always available and life long friendships have been made. Q7. I worry about my child entering competitive sports too early. Is Auskick competitive? Answer: For the first few years, matches are played for just two reasons and winning is not one of them. Kids unanimously report that what they like best about Auskick are the games of footy. They can enjoy a “friendly game” with and against their friends. The second reason is to learn the basics of teamwork, cooperation in a group, and respect for team mates and opponents. Competitive footy is something that they graduate to later on if they want to. Q8. Do I have to attend every week? Answer: Many parents and their children do because it is so enjoyable but it is not compulsory. There are no match schedules with teams in competition so nobody is let down by non appearance. Q9. What are the major benefits of participation in Auskick? Answer: A major benefit constantly reported is that it is fun and a chance to be with friends in a safe and controlled environment. Parents constantly make the same comment that they find it fun as well and a chance to be with friends. Q10. How old does my child need to be to join? Answer: Children turning Five years of age between Jan 1 and June 30 in the year they turn five are eligible for the NAB AFL Auskick program. Children turning 8 before July 1 in the calendar year should take part in Junior football. Q11. How do I find my local NAB AFL Auskick Centre? 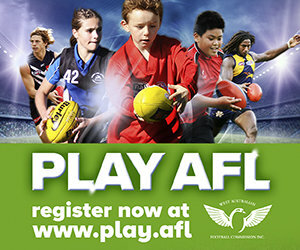 Answer: Go to the NAB AFL Auskick Website, www.aflauskick.com.au and click on the NAB AFL Auskick Centre Locator. Alternatively you can call the NAB AFL Auskick call centre on 1300 723 833. Q12. Who should I call about details of my NAB AFL Auskick Centre Activities? Answer: Your NAB AFL Auskick Coordinator whose details are listed on the NAB AFL Auskick Centre Locator. Answer: Prices may vary from centre to centre. However the Auskick program’s average registration costs are between $70 to $130. For more information contact your local centre coordinator.